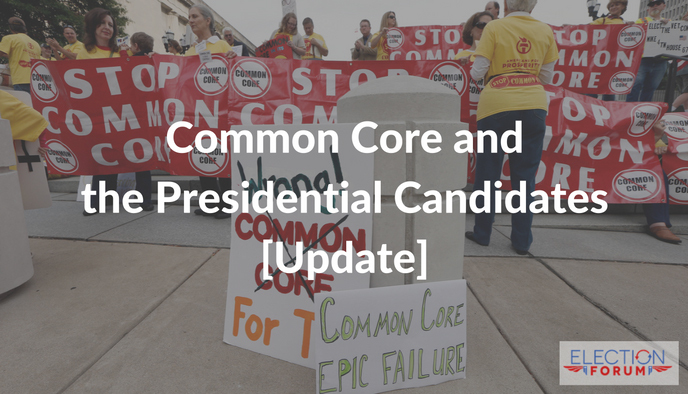 Finding out where the candidates stand on Common Core is tricky. Johnson has clearly stated his opposition the federal government’s involvement in education, including Common Core. I would abolish the federal Department of Education and very quickly. People don’t realize that the federal Department of Education gives each state 11 cents out of every school dollar that every state spends. But it comes with 15 cents worth of strings attached. As Governor of New Mexico, he signed off on a comprehensive voucher program. Stein: In general, high stakes testing is more than counterproductive–it is destructive. It is used as a political tool against teachers–targeting low-income and people of color. Our educational system should target lifetime learning–with full and equitable funding; and eliminating disparities by race. Testing for diagnostic purposes as part of standards [is ok, but we should have] curriculum written by teachers–not by corporate contractors. Stein: It’s not separable from the issues above so I’d say thumbs down. All schools and all students should have the option to opt out. And that’s not enough–because so much of school curricula have been destroyed–we need to teach multi-dimensionally and make schools relevant, using the arts, engaging the community, and more. What are your thoughts? Email me at [email protected].